Praying the Stations of the Cross has a long and honored history in the devotional life of the Church. In the very first centuries of the Church, pilgrims traveled to the Holy Land to follow in the footsteps of Jesus, walking the way of the cross to Calvary. The modern devotion as we know it was popularized by the Franciscans who promoted the use of images depicting the Lord’s Way of the Cross in special churches and shrines, so those who could not travel to the Holy Land could walk in the footsteps of Jesus and reflect on his passion, death and resurrection. In 1686, Pope Innocent XI encouraged Stations to be erected in every church. For almost 2,000 years, in every culture and place in which Christianity has spread, the Stations of the Cross have remained a part of Catholic life and prayer, encouraging the devotion of the people and nurturing the spirit of prayer. The Italian art studio of Ferdinand Stufflesser, which has been creating original works of sacred art for churches around the world for more than 140 years, created the Stations of the Cross for our church. The art studio worked closely with our parish to create beautiful works of art that would fit the style of our church and blend harmoniously with our stunning crucifix and sanctuary. The result is a seamless blending of the stations with the other elements of our church. 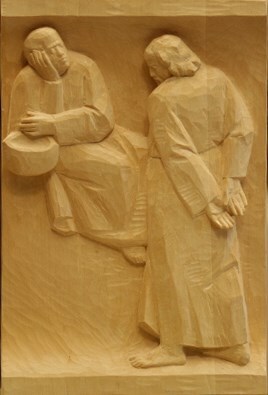 The Stations of the Cross are an important part of the prayer life at Holy Martyrs. We hold Stations of the Cross on Friday evenings during Lent. HMKids students also put on a moving Living Stations of the Cross during Lent. We invite you to come to any or all of these profound times of prayer and devotion. Our prayer path that winds through the woods beginning outside the Bishop Oscar Romero Chapel is lined with crosses that bear plaques commemorating the events that occurred during Jesus’ Passion and death on Good Friday. Visitors and parishioners are invited to use booklets containing various forms of the Stations of the Cross found in a literature rack in the entryway to the church for praying the stations.